The horror of the Civil War is in the accounting—a terrifying piece of accounting. 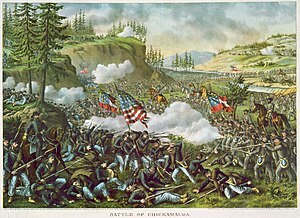 Between April 12, 1861 and April 9, 1865 (the last shot was fired in June) almost 2.2 million Americans fought against each other—almost 40% of those eligible for military service. In that time, approximately 625,000 Americans were killed, either in action, in hospital or illness. Another 402,000 were wounded, with injuries as varied as a scratch and a severed limb. 10% of the North’s population of military age, and 30% of the South’s never came home. We will never know for sure the total number of civilian casualties. I bring out these numbers as a static, mathematical reminder of the costs of fanaticism, militaristic saber-rattling, authoritarian usurpation and a lack of compromise. The math can often resound decibels louder than any rhetoric. Tomorrow, we mark the 150th anniversary of the greatest disaster in our history, and I mean “greatest” in all its senses. The Civil War has been written about to death. It has been the culprit of reams of academic pap, both useful and useless, often hashing and rehashing the debates about slavery, states’ rights, civil rights, Lincoln’s actions and inactions, as well as every slight movement of the battlefield in those little blue and red rectangles. If that wasn’t enough, the unlettered masses have fistful of Hollywood movies, some good (Gettysburg, Glory, Gods and Generals) and some God awful (Sommersby –I threw up a little on saying its name). Then there’s documentaries, docu-movies, PBS documentaries, History Channel documentaries, even those weirdoes who dress up each weekend, playing ancestors with which they have a dubious family connection. There’s no way ALL you guys had a great uncle who fell at Shiloh, right? In a sense, the sesquicentennial ruckus can be just as disturbing as the war itself. That’s pretty frightening, since the greatest effusion of blood in American history still hold lessons today—particularly in how we forget our past. David Von Drehle, in a funny connection to two anniversaries this year (he wrote the book Triangle, about the 1911 Triangle Shirtwaist Fire) wrote an interesting piece in this week’s Time Magazine about a collective amnesia Americans from both North and South have about our greatest conflict. In a nutshell, Von Drehle writes about how Americans have washed away the more distasteful or painful elements of the Civil War in the course of 150 years. The persistent need to push the slavery issue as secondary to the issue of states’ rights. Slavery, in fact, was the elephant in the room ever since the Revolution, and even Thomas Jefferson (himself a slave owner) prognosticated civil war over the issue. The connivance of monied interests on both sides. Arms, munitions and logistics industries in the North were itching for a conflict to cash in on army contracts. Yet there were even more business to be lost by the South. Southern cotton not only greased the wheels of the mills in New England and the clothing factories in New York, but also buttressed the textile industries of Great Britain, France, even Germany. New York City, in fact, came close to “seceding” from the Union over the issue of lost revenue due to the lack of cotton. The lack of enthusiasm—and outright rage—over fighting to free enslaved Africans. The 1862 Emancipation Proclamation was not met with resounding enthusiasm, even in the North. Many states began to question continuing the war. The Irish of New York rioted outright in the summer of 1863, fearing they would lose their jobs to free blacks. Even the arrival of black soldiers did not ease the racism and hatred that pervaded the North—a hatred well established in the South. The burial of the events leading up to the shots on Fort Sumter. Events such as the Kansas-Nebraska Act, “Bleeding Kansas,” the Pottowatamie Massacre, the 1857 Dred Scott decision, even so far back as the compromises of 1820, 1850 and the Fugitive Slave Act. Furthermore, the period after the war became a time when veterans of the Blue and Grey would meet in reunions as brothers to remember the old times—and to decry the Northern reformers and shiftless Blacks that sent them to fight in the first place. Ever since, according to Von Drehle, we have been struggling to find the complete story. This anniversary, we at the Neighborhood implore our readers to look at the Civil War with open minds, with clear eyes and with an empty heart. Take a new look at the war for yourself, filtering out the din of media and talking heads. Look at the photos. Read the letters. Hear the arguments. Examine the carnage. Let the war speak to you. In fact, 625,000 soldiers speak to us everyday. They speak whenever we debate about the government’s role in our lives, be it on the federal or state level. They speak whenever an American is slighted due to race, ethnicity, religion, or socio-economic status. They speak when moneyed classes suffer a severe disconnect from the reality of the American people. Most importantly of all, they yell—they scream—when intransigent politicians, policymakers and ideologues entrench in their opinions with no room for compromise. The 625,000 are the warning of fanatical, unscrupulous, un-American partisanship. Their number, and their silence, is the loudest of all. I’m still in the process of finding that perfect computer game that can simulate the battle experience best for my students. In the meantime, I will be using what is fast becoming one of my favorite websites. History Animated has been in heavy rotation in my lesson plans for the past two years. Every time I use it, students say two things: (1) Wow!, and (2) Can you burn me a copy, Mr. D? Few interactive experiences give as much information–and provide such a chance to be an armchair general–as the interactive battle maps from the folks at this site. Part of what makes History Animated so fun is that its founder has, on the surface, little to do with history. James Cagney (from what I can tell, no relation to the actor) was a former tech exec who now teaches Computer Science at Central Oregon Community College. According to Cagney, as he was reading books about various wars and seeing only “complicated maps with dotted lines and dashed lines crisscrossing the pages,” he decided to use computer animation to make the maps real. So far, Jim and his team have created animated maps for the French and Indian War, the Revolutionary War, the US Civil War, and World War II, both in Europe and the Pacific (he correctly denotes the Pacific Theater as a separate war, as do most historians and political scientists). In each, the dashes, lines, thrust arrows, etc. of a conventional battle map come alive through detailed computer animations using various resources. With each animation, there are also loads of information about the generals, organization of the army, weapons, and background on the wars themselves. They even provide bibliographies for further reading on each particular battle. To an extent, History Animated takes a real effort to provide accurate animations, often clocked to the hour. Now, in WWII, this seems more of a possibility. With earlier conflicts, this could become more like guesswork. Yet the team at History Animated have really done their homework, using all available sources to provide the best picture possible. However, if you’re looking for realistic pictures of combat, then look elsewhere. This is the main reason why I use this so often: it provides a safe, non-graphic method of analyzing an often gruesome subject. The sounds of marching, gunfire, horses and trains magnify the movements of the rectangular units on the map. That’s it. That’s the extent of the violence. In a way, it gives a student the rare perspective of conducting war from a general’s standpoint. One way I like to use this is to let my students be the general. For example, I will show the animation of a particular battle, say, Shiloh in 1862. I would then stop the animation at a certain point and then pass out papers with screen captures of the point in the battle they are looking at. In teams–half of them are Union, half Confederate–I ask each group to plan the next move for their side. What seems very easy will often get complicated when considering escape routes, timing, weather, terrain, location of reinforcements, etc. All the animations are online: you can get the CDs of them for your hard drive for a small donation. Even if you’re not a teacher, nor a history buff, History Animated offers an interesting way to view the great conflicts of history. Visit often, since they update their selections periodically. Tell them Mr. D sent you.